I have partnered with Life of Dad and Idahoan® Foods for this campaign, but my opinions are my own. Every parent has had those nights where you just want to eat great food in a steakhouse type atmosphere. 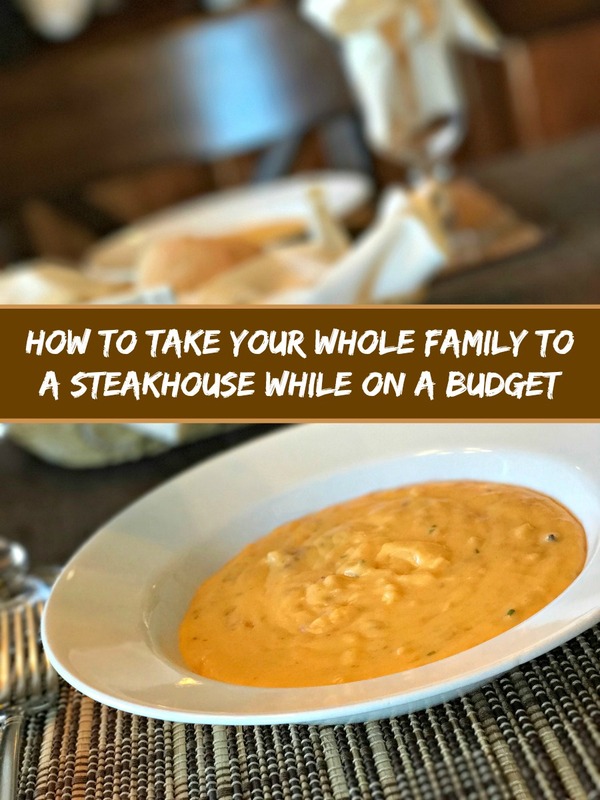 However, either the budget was spent on diapers or the thought of loading the entire family into the car, and keeping the kids from throwing their meals against the restaurant wall, sounds way too exhausting to make the excursion worth the effort. We felt the same way the other night and decided to do something about it. We created our own steakhouse right at home. You can too with a little creativity, Idahoan® Premium Steakhouse® Potato Soup, and my tips below! Step 1: Collect some items from around your house. Creating the steakhouse feel is key, but it's not as difficult as you might think. You could add a dark wood feel with cloth napkins and a nice tablecloth. 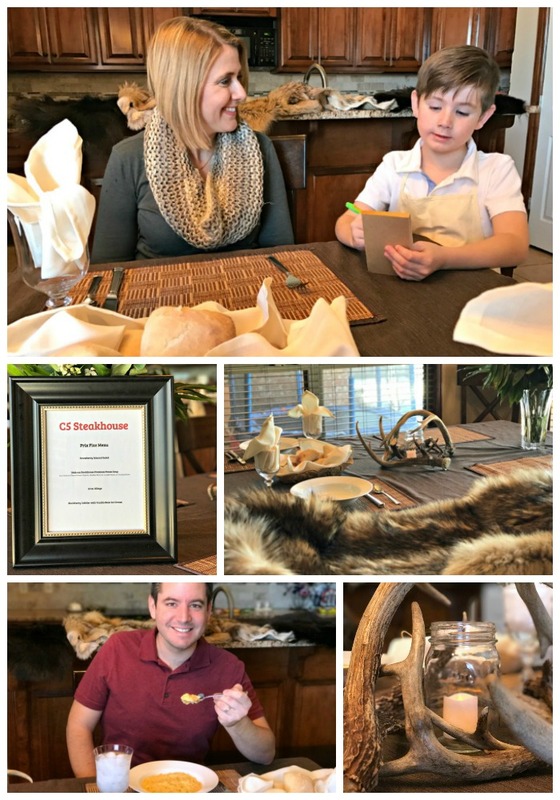 We went with a formal but rustic look with some deer antlers for a centerpiece to give it a cabin in the woods atmosphere. With a quick look in the garage or the office, you might have just what you need to create your family steakhouse. Just remember, don't forget the candles! Step 2: Prepare Your Menu. You can't have a steakhouse without the food. Use your imagination and try to include food that you already have in your fridge and pantry. You'd be amazed at how fast you can whip up a gourmet dinner. 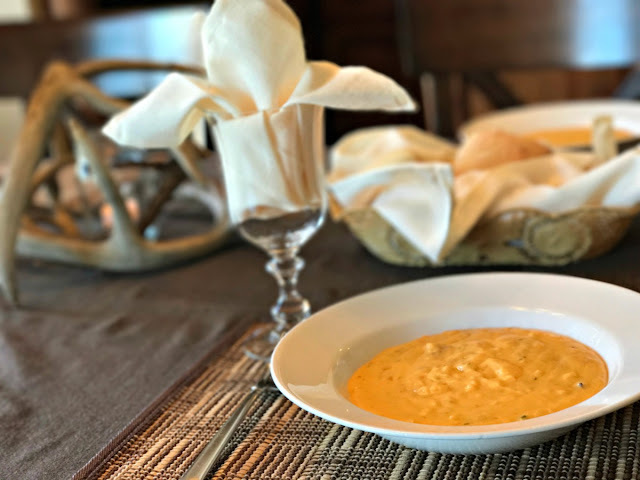 We included salad, rolls, ribeye steak, blackberry cobbler with ice cream, and the special of the day: Idahoan® Premium Steakhouse® Loaded Potato Soup! It's a hearty soup that only takes five minutes to cook by just adding water. Other dry soups take more than fifteen minutes to make. 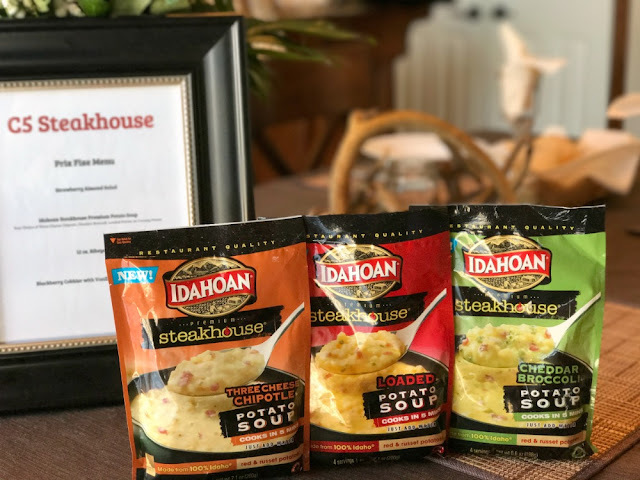 Idahoan® Premium Steakhouse® Soups come in four flavors and are filled with real Idaho® red potatoes and red potato skins for a restaurant-quality soup in your own steakhouse at home. One thing that we did to add a little flair was to print out the menu for the night. We typed it up on the computer and put it in a frame that we had packed away. It's the details that matter! Step 3: Give your kids fun jobs. Don't leave your kids out, give them fun jobs. Let them help set up, cook the food, or create the name of your steakhouse. We named ours C5 for the five Coffrons in our family. How long has it been since you and your spouse had a date? This could be a great chance, just give your kids some responsibility. 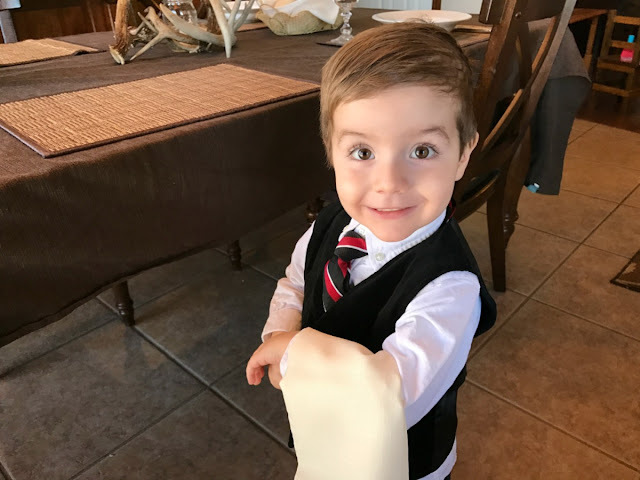 We had our daughter be the chef, my oldest son was the waiter, and my youngest the maitre d'. They all had a fantastic time! Step 4: Come hungry and leave stuffed. The last step is to make sure your entire family eats well and spends quality time together. It shouldn't be hard with the menu you've put together. 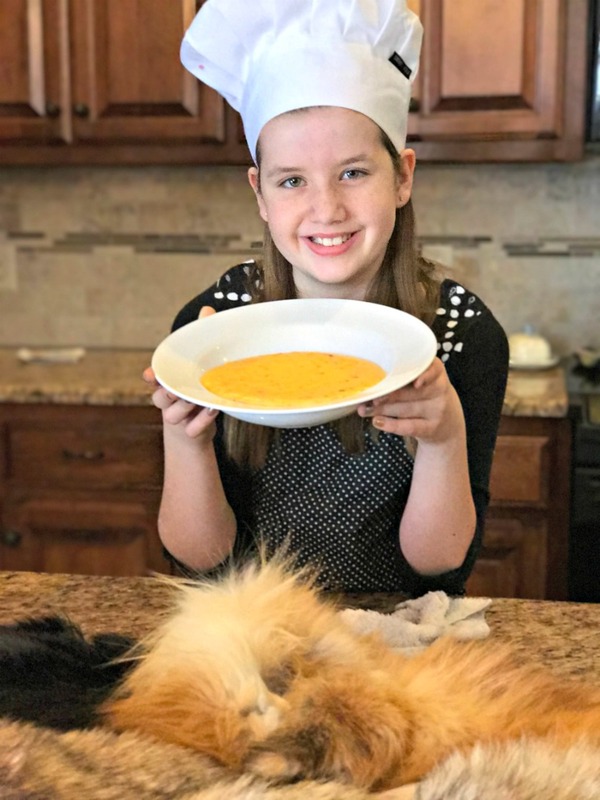 My entire family loved the experience and especially raved about the soup. There wasn't a drop left. To find out more about Idahoan® Premium Steakhouse® Potato Soups make sure and visit www.idahoan.com, or @IdahoanFoods on social media! Let me know how your steakhouse at home turns out! What kind of creative ideas can you come up with? Make sure and share them on social media, tag @lunchboxdad and use #KingofSoup!